This semi-waveless waterbed mattress contains 2 layers of fiber to reduce motion while still allowing for adjustbility. A 12 year warranty reflects premium quality and workmanship. Includes FREE stand up liner and FREE waterbed conditioner. This semi-waveless waterbed mattress helps reduce uncomfortable pressure points, allowing you to experience a deep rejuvenating night's sleep. 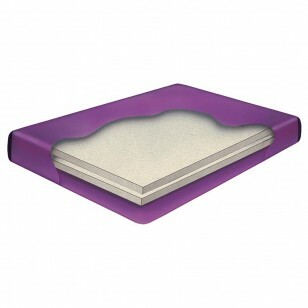 The Boyd Flotation Constellation 2 Waterbed Mattress is made of high quality long-lasting virgin vinyl with a precision design and double reinforced corners for extra strength. This waterbed mattress contains two layers of wave reducing fiber, providing approximately 60% motion reduction, while still allowing for a degree of motion and adjustability. For use in a traditional hardside wood box frame. Replaced 19 year old mattress and love this one. Its very comfortable, easy to install and filled much faster than I expected. Quality is exceptional. My cats hated my old one but love to lounge on this one. I expected shipping to take awhile after reading some of the other reviews but mine showed up at the door in about a week. Am very happy with purchase. In May 2018 my super single mattress finally ate the big one; corner seam gave out. It was 25 years old so it was time. Initially I had to put off on a new matress as I found a site that had thrm starting at $200 for a full wave mattress...thankfully I kept searching and found Boyd's. Very good price for quality. Constellation 2 is amazing. Just enough wave to waveless attributes. Combined with a new heater and it was so great. After being on a cot for 2 months to save up beforr finding Boyd's....foolosh mistake but once that mattress was filled I just toss a sleeping bag on top until it heated up....and slept for 20 hours. We really like this waterbed mattress. It was easy to set into place and fill. It is a semi motionless mattress and we can get in and out with out bothering the other person. As I read in other reviews, the smell of the liner was horrible. We aired it out with the room door closed for 3 days. Finally, it got to a usable point. The waterbed mattress smell was nothing compared to the liner.